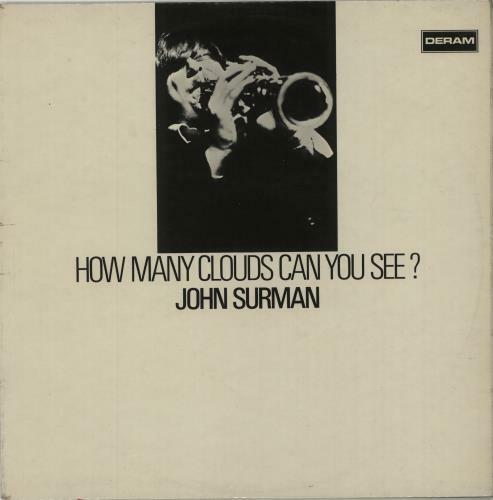 JOHN SURMAN How Many Clouds Can You See? (Rip-Roaring British Jazz 1970 UK first press 5-track stereo LP with matrices ending '1W', the highly admired second album by English saxophonist John Surman, also starring Harry Beckett, Alan Skidmore,Barre Phillips & Tony Oxley & released on the collectable Deram label. The front laminated picture sleeve has the stereo/mono indicator hole on the back & comes complete with the original blue-for-stereo inner. The sleeve is Excellent with just alittle light edge & ring wear. The vinyl grades VG+ with a number of light paper hairline scuffs & spindle marks which have little to no effect on play.... SML-R1045). B2	How Many Clouds Can You See?